Nothing captures the essence of summer quite like a great outdoor picnic. Whether you are enjoying a day at the beach, in the mountains, at a park or at your favorite spot in the countryside, we have put together a collection of delicious light snacks which would make great additions to any picnic basket. After a leisurely hike or fun games and activities at the beach everyone will have worked up a good appetite and that’s when it’s time to break out your well-packed picnic baskets and coolers. Light summer snacks like fresh fruit and salads as well as sandwiches make perfect picnic food. Here’s an important rule of thumb for picking the right salads and sandwich toppings: avoid lettuce which will wilt easily as well as ingredients which spoil fast and require constant refrigeration. Finger food sized sandwiches, reminiscent of British tea sandwiches. The baby dills add zest and a nice crunchy texture to these otherwise soft bite-sized treats. These refreshing sandwiches combine crunchy celery with flavorful cheese and ripe tomatoes. Soft sandwich bread and light salad cream hold these healthy snacks together. Great texture, summer flavors! The epitome of summer flavor! Grilled bell pepper, eggplant, zucchini and oyster mushrooms combined with aromatic basil and crisp lettuce. Scrumptious and nutritious these fish sandwiches are a perfect meal for your next day trip, be it a picnic in the country or a day at the beach. Though both New York and Omaha claim to be home of the famous Reuben sandwich, it is actually created using German ingredients. A collection of sandwich ideas to perk up a summer picnic or lunch party. A salad which is as stunning as it is delicious! The cucumbers and bell peppers provide crisp textures, the eggs give the salad great substance, the mushrooms add an earthy aroma and the fresh herbs provide wonderful flavor and depth. The combination of little red radishes and apples make this salad a crisp and refreshing delight. The sharp and tart ingredients are balanced out by delicious German Emmental cheese. 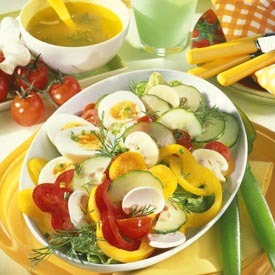 With a somewhat unusual combination of vegetables and flavors, this salad gorgeous salad will wake up your taste buds. Pure purple power, this salad is chock full of flavor and nutrients. Premium preserved and pickled vegetables from Germany make this impressive salad a breeze to prepare. Fresh red cabbage, radicchio and red onions add a great crisp contrast in texture. Plums complete the flavor palette with a wonderful fruity note. German potato salads are mostly made with a meat stock or oil and vinegar dressing, creating a more healthful dish that is more likely to withstand hot summer temperatures at a backyard barbecue. German potato salads are not just for serving as an accompaniment to a cold meal. There are many hot dishes that are complemented by a good potato salad. The most simple and sublime are meaty Bratwursts, complete with a nice big spoonful of German mustard. Finally, a simple serving tip: don’t serve potato salad straight from the fridge. It is best only lightly chilled so remove at least half an hour before serving. Potatoes and lentils are a very popular combination in German cuisine and this salad brings them together in a fresh and delicious way. The recipe is easy to make because the potatoes and lentils may be cooked together. German spätzle is a wonderful choice in any pasta salad because it has such a satisfying texture. This recipe may be halved. Celery root is officially known as celeriac. The knobby, brown vegetable tastes like a combination of celery and parsley. Choose a small, firm celeriac with few rootlets and knobs. This salad is nutritious, colorful, chock full of tasty ingredients, and easy to toss together. Serve it with some German wholegrain crispbread or sunflower seed bread.